Perhaps it's the Celebration this past month, but I am sticking with the boy stuff for a little bit. There are two cute new baby boys who need (well, maybe not "need"...) something cuddly. 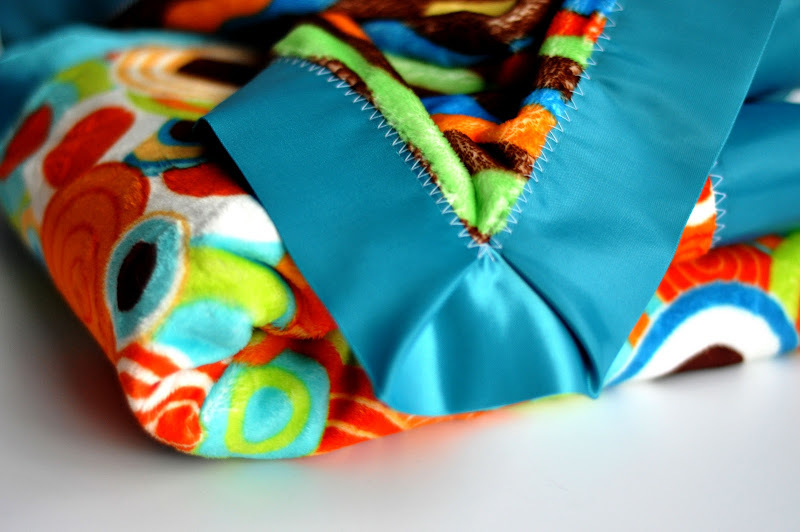 I love minky and satin blankets--who doesn't? I've been making the girl versions up to this point but it was time for something a bit more masculine. So here are the Lovey Boy and the Square Satin Luxe Blanket. Unlike the Luxe Lovey and Luxe Baby Blanket, these are ruffle free. Instead there are little pleats at the corner. Not only do these help turn the satin binding at a right angle, but they create some added dimension on the silky edges. 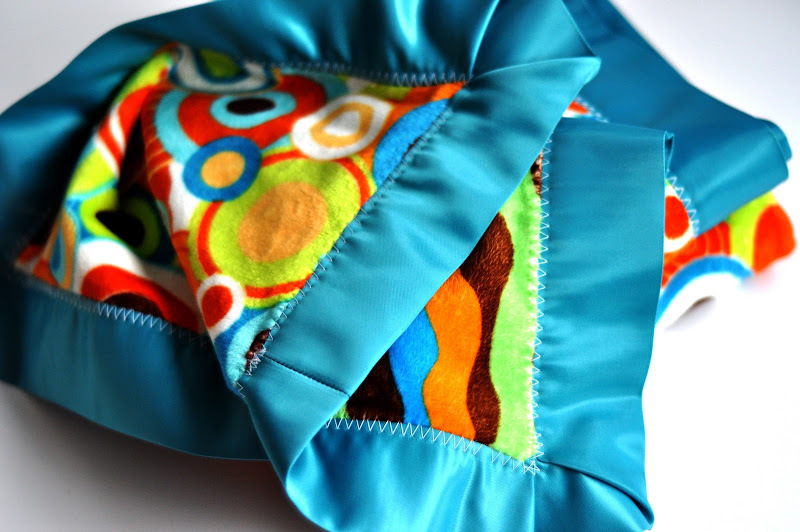 More tactile fun for baby (or whoever is using the blanket!). I made the blankets 36"x36" before the binding, so they're a little bit larger. It's a good size to use as a blanket or a play mat at home. The Lovey Boy is 12"x12" before the binding, which is a generous sized Lovey, perfect for throwing in the car seat to keep baby company. At least it seems to works for Tess. She has one in her car seat and one in her cradle. I like the idea of a set of these so if the baby bonds with this particular combination of textures there are a couple of options for keeping it close by. 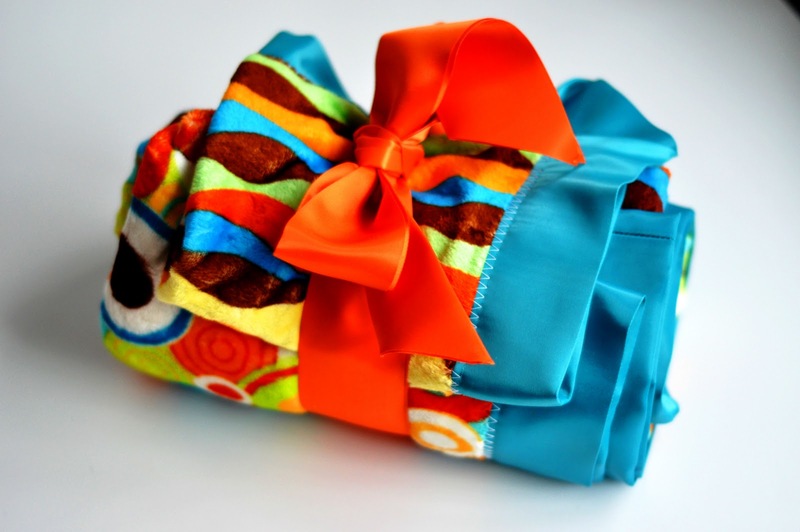 The minky is Robert Kaufmann Balloon Party and Ribbon Party in Orange/Rust. The satin binding is Wright's in Mediterranean and Orange. I sewed the binding in a contrasting white thread with a zigzag stitch. I think it looks kind of fun and it has the added bonus of a bit of margin for catching both sides of the binding since I was using the "sandwich" method of applying this. It's quick! All wrapped up to gift: a Square Satin Luxe Blanket and a Lovey Boy. One for home and one for on the go. If you are interested in the tutorial to make a set click to read more. For the Lovey Boy: 2 pieces of minky, each 12"x12" (1/3 yard is 12"x60" so you can cut 5 12" squares out of it--if you buy 1/3 yard of 2 pieces you can make 5 Lovey Boys!). You'll also need 64.5" of satin blanket binding. One package of Wright's blanket binding will make 2 Lovey Boys. 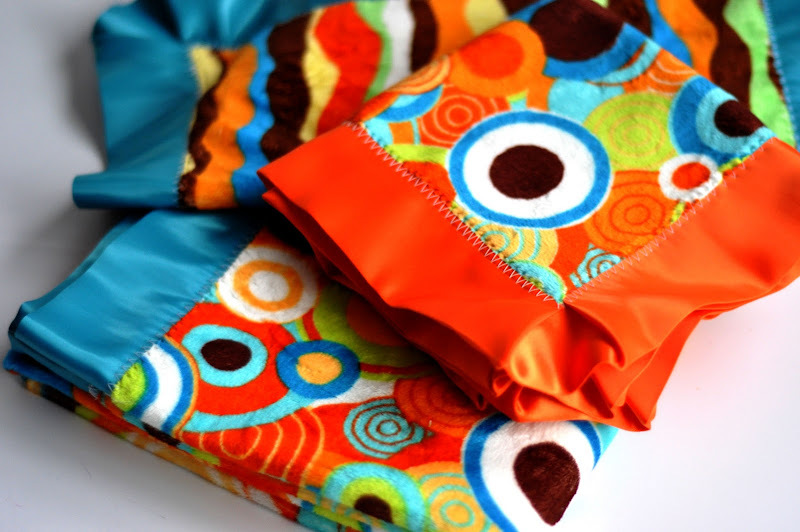 For the Square Satin Luxe Blanket: 2 pieces of minky each 36"x36". (If you buy one yard each of two different 60-wide minky fabrics you can cut out a 36" square Luxe Blanket and have two 24"x36" pieces remaining--enough to make 6 Lovey Boys.) You'll also need 160.5" satin blanket binding. one package of Wright's blanket binding will make one 36" square blanket. I've found the easiest way to cut the fabric square is to pull up your 12" or 36" side from the corner and align with the other edge to form a triangle (aligned edges at the top in the photo below). Then use the other side of the triangle (the left edge in the photo below) as your cutting guide. Perfect square! You should have two square pieces of minky fabric. Either 12"x12" for the Lovey or 36"x36" for the blanket. Stack these square pieces of fabric wrong sides together and pin along all edges. Baste with a .5" seam allowance all the way around the square. Next we will "sandwich" the blanket binding around the minky. It's important before continuing to make certain you have the right length of satin binding to use. You need enough to edge each side of your square, plus more to turn the corners: 160.5" for the 36" blanket and 64.5" for the Lovey Boy. If you are making something a different size, or rectangular for instance, the formula is: 2(l+w)+16.5, in the case of a 12" Lovey, 2(12+12)= 48 inches, plus 16” to turn the corners (it takes 2 times the width of the binding for each corner, so 2x2" or 4" for me), plus .5” for seam allowance (we’ll be sewing the ends together). So my total is 48+16+.5= 64.5”. Double check yours! Open out the blanket binding and put the raw edges right sides together. Pin in place. Stitch with a .5" seam allowance. Press open this seam, then fold binding in half again and press to maintain the outside fold. Now you should have a "loop" of satin binding. Divide this in four equal parts: start with the seam, mark it with a pin, and fold the binding in half there. Mark the fold at the opposite end with a pin. Now bring these pins together so they are in the middle and mark the folds in the binding at either end with a pin. These four pins should be equal distances apart. Align the seamed edge and pin on the blanket biding with the middle of one side of your minky square. "Sandwich the minky between the folded binding as shown below and pin the binding all along this first edge, leaving about 2" free at either end (the slack for making the pleats in the corners). Repeat this process along the remaining three sides of your minky square. Start by matching the pin on the blanket binding with the center of the square and pin out to the corners leaving about 2" of slack in the binding. Now the fun part: creating the pleats! This takes a bit of patience as you have to work with the binding to get the pleats as you'd like them. I found this to be the easiest way for me to do it, but there are likely others equally effective. Start by pulling out the slack in the binding from one of the corners to identify the midpoint. Now push down this midpoint on top of the corner of your minky square. You'll now open up the binding and sandwich that corner between the layers of blanket binding. When doing this I found it was pretty easy to open up the top layer of binding and maintain the folds just created in the bottom layer. Fold the top layer of blanket binding back down over the corner. ...so that the top layer of the binding folds, or pleats, at an angle. These pleats should look identical on the opposite side. These form easily when you find the midpoint and make the first fold on the top layer, but if you find something different on the back side when you flip yours over make the adjustment by folding as you did on the top side. I made quite a few adjustments on both sides to get the folds aligned neatly in the corners--not perfectly, but pretty neatly! The corners don't lie perfectly flat, which I think is nice. Pin well and get ready for sewing. Starting at the seam in the blanket binding, sew a wide zigzag stitch along the raw edge of the binding all the way around the minky square. You could certainly use another stitch. I like the look of the zigzag and it provides a bit of wiggle-room for catching both edges of the binding in this single sewing step. That's it! 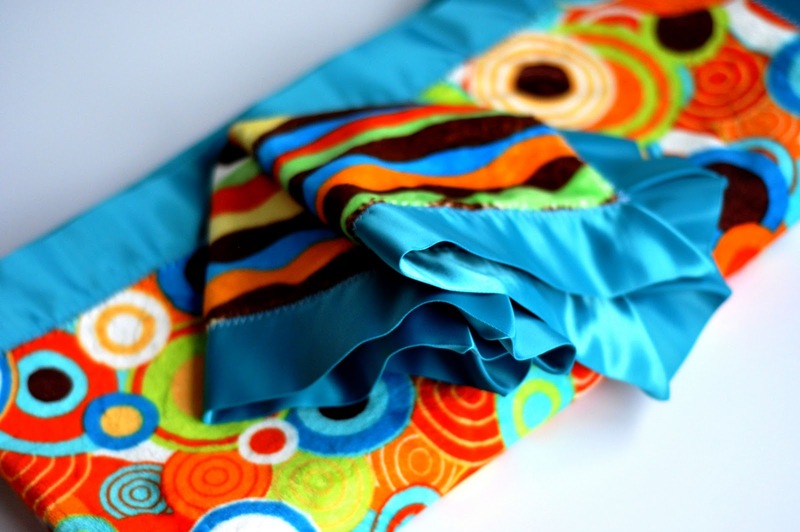 You have your Lovey Boy or Square Satin Luxe Blanket to gift or to keep. I love the colors and the super cool corners. I have a minky question. In the past I have had trouble with keeping my minky from stretching or getting wonky, especially if I am sewing one side minky and the other cotton. Do you have any tips? Oh my goodness - I love this blanket!! The colors are so bright and I love the design. I posted a link to this on my own blog. Thanks! @Josh and Laura and Jennifer: Thanks so much for commenting and congratulating! So nice of you! Kind of fun--Babble is such a great site--I'm excited! @Jayna Rae: I guess I've just had really good luck with minky because it hasn't gone very wonky on me. I did have issues with the satin and minky blankets I made for my girls a while ago but I thought the satin was to blame. I haven't tried combining with cotton and that is probably tougher since they would stretch differently. My advice would be to pin a lot, stretch/ease to fit as your sewing between the pins, and my mom always taught me to sew parallel seams in the same direction so that if one layer stretches more it will at least all stretch in one direction and you'll have the option to trim the excess at the bottom edge--make sense? That is so sweet! Great tutorial! I'd love to have you share this at my For the Kids Friday Link Party! Stop on by and see what we're up to! I love the pleated corners...I always have such trouble with the corners and I like the look! love this tute!! I hate to sound stupid, but what is "minky"? Is it like the fleece I see everywhere? @Janie: Minky is velvety smooth and has a nap. It also has a wrong side to the fabric. It's not as plentiful as fleece. Joann, for instance, carries a bit of it, but I've had the best luck buying on line. Once you feel it you will have to use some for some project--unbelievably soft! OMG!! How creative!! My cousin who lives in St. Louis (I live in Cali) is having a boy and I think I'm going to make him a couple of these to send out! Thank you so much for the tutorial!! I came to your site for the first time because First Lady of the House recommended it. WOW!!! I am in love with all that you do! I REALLY love that you have patterns, and tutorials!! I try to be crafty, but need my hand held and your site does that! Thank you, and I will be back often! I'm making my son a flannel blanket with a satin binding, and I just got to the corner and was like, "Oh, how do I do those pretty corners????" :) In the past I've done the mitered corners, but I'm gonna try the pleats. Your finished project is definitely beautiful! Wow thanks for tips ! Great article, i will use its :) .